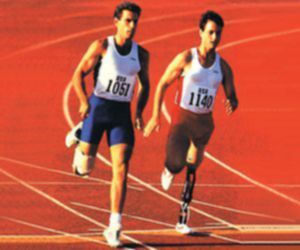 Our company, Kyritsis Orthopedics is active on the field of prostheses since 1974. Today, we have a fully equipped laboratory at Mesogeion 297, Chalandri with the latest technology (machinery and devices) for the construction of prostheses and joints. The technical stuff of the company has long-standing experience on the field and attend all the technological evolutions through participation to international seminars for professional education across Europe and America. Our laboratory is equipped with a special training room for the proper walking manner of patients, as well as a demonstration of all the useful tools on the field of rehabilitation for prostheses and joints. The construction materials (raw material and accessories) of the prostheses are manufactured by the most famous and internationally recognized factories (OTTO-BOCK/Germany, VESSA/England, FLEX-FOOT, BECKER, U.S.M.C.O./America, PROTEOR/France. The materials used are high quality and guarantee comfort, mobility and effectiveness.